We are a leading Exporter of stainless steel bread baskets, plain steel fruit baskets, kitchen fruit basket, steel fruit baskets, bread baskets and stainless steel fruit baskets from New Delhi, India. 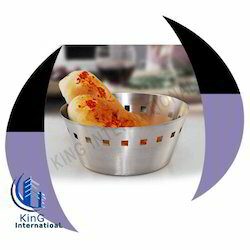 We are successfully ranked amongst the top manufacturers, exporters and suppliers of a qualitative assortment of Stainless Steel Bread Baskets. Owing to its longer service life, scratch resistance, unmatched quality and anti corrosiveness, the offered product range is highly valued among our clients. Our offered basket is manufactured using high grade material and advanced technology in compliance with the industry quality standards. 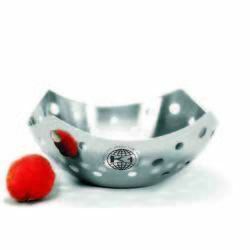 We offer customers high quality Plain Steel Fruit Basket in standard sizes. These are manufactured using superior grade chrome plated stainless steel metal so as to provide in these exclusive and long lasting finish standards. 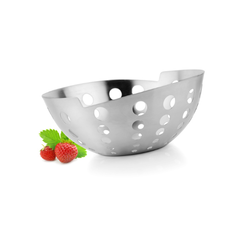 We offers fruit basket, heart shape fruit basket, side cut fruit basket, steel fruit basket, elegant fruit bowl, fruit bowl, stainless steel fruit bowl, steel fruit bowl. Offering a wide range of Kitchen Fruit Basket to our valuable client which can be availed in diverse designs, sizes and shapes as per the requirements of our clients. In order to meet defined quality standards, these are manufactured using high quality basic material. 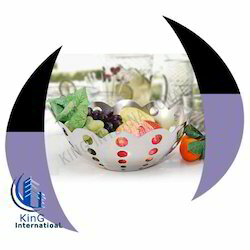 We are offering a wide range of Steel Fruit Baskets to our valuable clients. 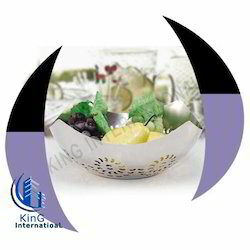 Offering a wide range of Steel Fruit Baskets to our esteemed clients. These can be availed in diverse designs, sizes and shapes as per the requirements of our clients. We are offering a wide range of Steel Fruit Baskets to our valuable client in different specification to meet the diverse requirement of client. Offering a wide range of Bread Basket to our valuable client in different specification to meet the diverse requirement of client, which is fabricated in compliance with the international quality standards. The offered range of baskets is manufactured using premium quality raw material and sophisticated technology. In order to facilitate our clients, this product is offered in different specifications and at industry leading prices. This bread basket is highly demanded due to its perfect finish, attractive designs & patterns, strain resistance and long lasting nature. 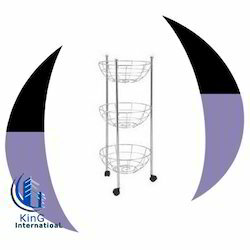 Offering a wide range of Stainless Steel Fruit Baskets to our valuable client in different specification to meet the diverse requirement of client that is designed and developed using latest technology and the finest quality factor inputs in order to meet the international quality standards. These are broadly appreciated in the market for durability, reliable performance, robust designs and corrosion resistance. Further, these can be customized in various specifications as per the requirements of our clients and are available at highly competitive prices. We are manufacturer and supplier of Steel Fruit Baskets. We are providing these products in diverse designs, sizes and shapes as per the requirements of our clients. We are offering a wide range of Steel Fruit Baskets to our valuable client which can be availed in diverse designs, sizes and shapes as per the requirements of our clients. 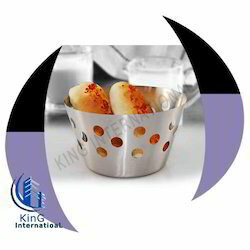 The Steel Bread Basket that we have are well designed and are sure to be noticed. These baskets are available in various sizes and colors to meet the clients needs. The offered range of baskets is manufactured using premium quality raw material and sophisticated technology. In order to facilitate our clients, this product is offered in different specifications and at industry leading prices. We are the leading manufacturer, supplier and exporter of the Simple Fruit Basket which is available in different size, color and designs. Our range of Fruit Baskets are available at market leading prices.With wide and rich industrial experience, we are able to offer finest quality Simple Steel Fruit Basket, to be used in hotels, restaurants, resorts and residential homes. 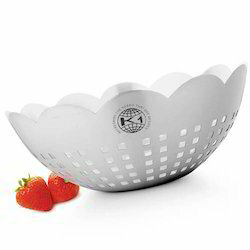 This beautiful, aesthetically designed fruit basket can be the focal point in your kitchen and drawing room as well. 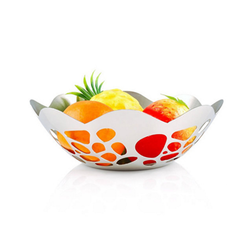 Fruits look attractive when placed in this basket and encourage your children to eat them.